Mike Hawthorne: Drink and Draw up for an Eagle Award! Just got the word from my man Dan Panosian that the Drink and Draw book has been nominated for an Eagle award! The book was a collection of drawings from the members of the "Drink and Draw Social Club". I got to take part in one of their get togethers when Dave Johnson was in Philly and I even got a few drawings in the Drink and Draw book put out by Image Comics. Not sure if that makes me a direct member, but those dudes are still close to my heart. Go vote for the fellas! Scroll down to the "Comic Book related books" section. NOMINATIONS are invited for this year's Eagle Awards; you can designate your 2007 favourites in 30 different categories at www.eagleawards.co.uk/nominate.asp. As initiated in 2007, in order to offer a broader spectrum of the industry, voters will be asked to select from the top five nominees in each of the 30 categories. Nominations, which are once again open to the comics reading public worldwide, close at midnight on Saturday, March 22. Voting is to begin on Tuesday, April 1 with the winners announced at the Bristol International Comic Expo on Saturday, May 10, 2008. The award ceremony it the highlight of Britain's premiere comics’ event and will be held at Bristol's Ramada Plaza Hotel where the ceremony is to be hosted by British TV and sitcom personality Fraser Ayres, best known as a regular in The Smoking Room and Thieves like Us. Assisting him will be Eagle Awards regular Cassandra Conroy, daughter of awards founder, Mike Conroy. The presentation is to be preceded by the traditional gala dinner. With demand for tickets always high, early booking is highly recommended. Reservations can be made through Martin 'Biff' Averre, who can also provide further details. He can be contacted via email at martin@acecomics.co.uk or by telephone on 01206 364140 (011-44-1206 364140 from North America). Join us, and nominate now! ABOUT THE EAGLE AWARDS – Established in 1976 by Mike Conroy, the Eagles are the comics industry’s longest established awards. Acknowledged as the pre-eminent international prizes, they have been featured on the covers of leading US and UK titles across the last three decades with such diverse titles as X-Men, Swamp Thing, Preacher, 2000 AD and MAD among those proud to display the Eagle Award emblem. 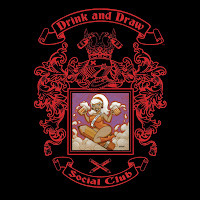 Drink and Draw sounds fun!! !